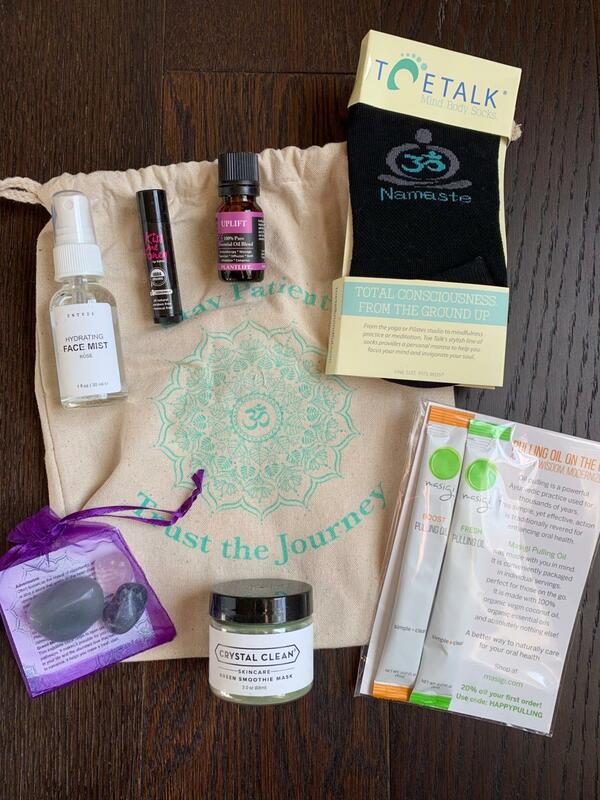 BuddhiBox is a curated box of items to enhance your yoga practice and lifestyle. BuddhiBox is $34.95/month (+ $5 S/H), and each month you will receive 4-6 full and sample sized items that enrich mind, body, and soul. Items may include healthy food, supplements, beauty products, and yoga accessories. 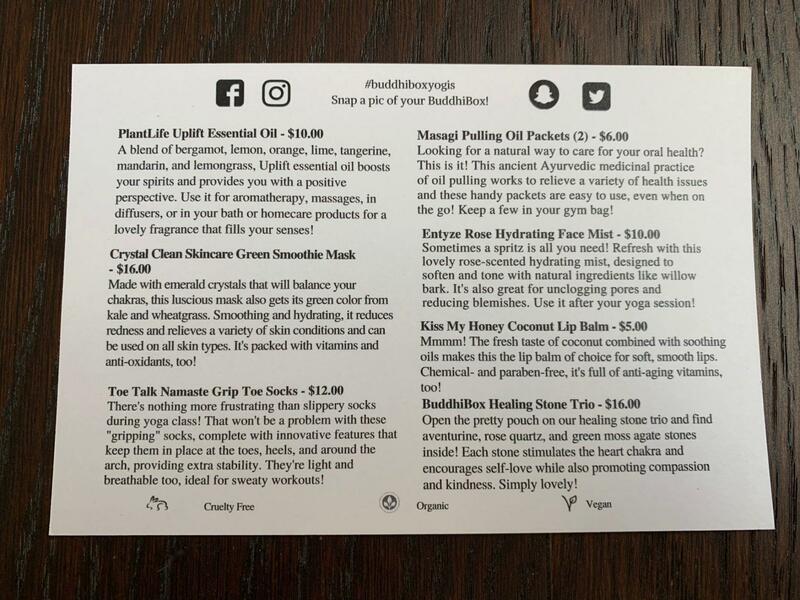 BuddhiBox also offers a Jewelry subscription and an essential oil subscription plan. BuddhiBox ships via USPS. 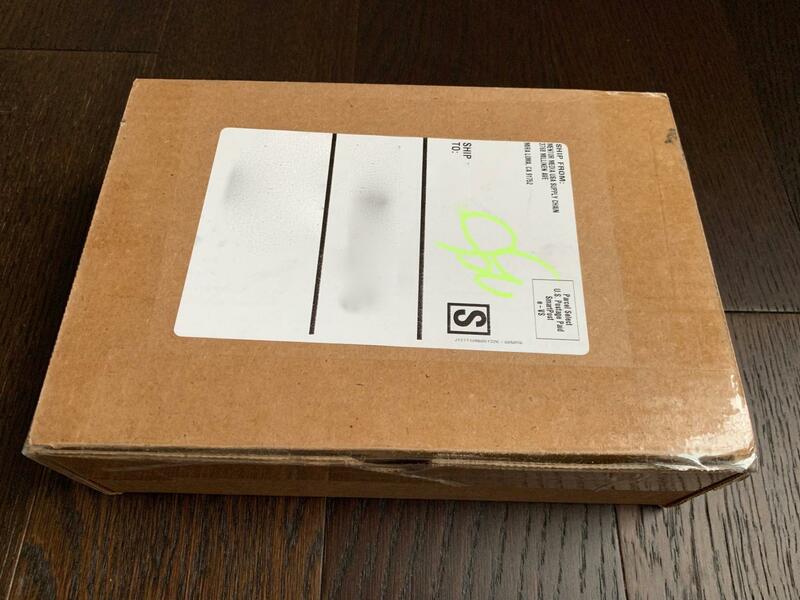 Boxes always ship on time and I do not believe I have ever had an issue with a missing or broken product. 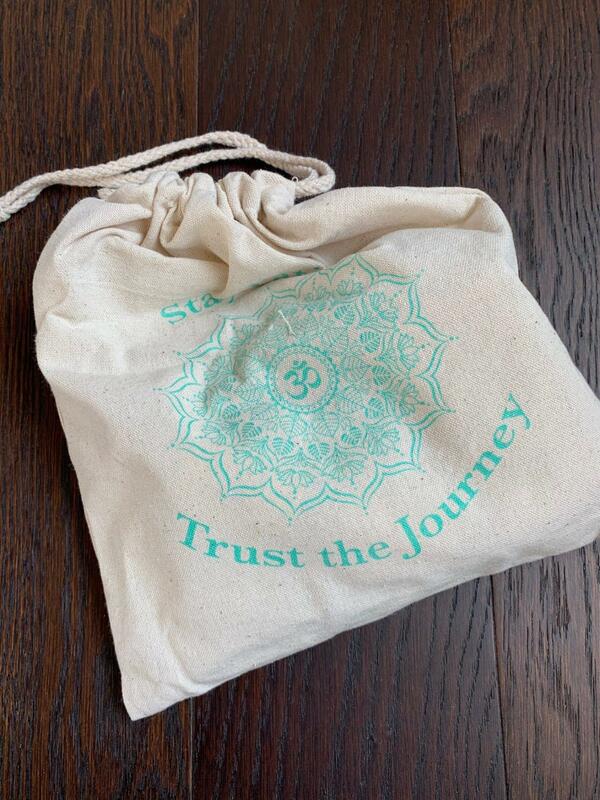 Inside the box is a cloth drawstring bag with all of the month’s items inside. 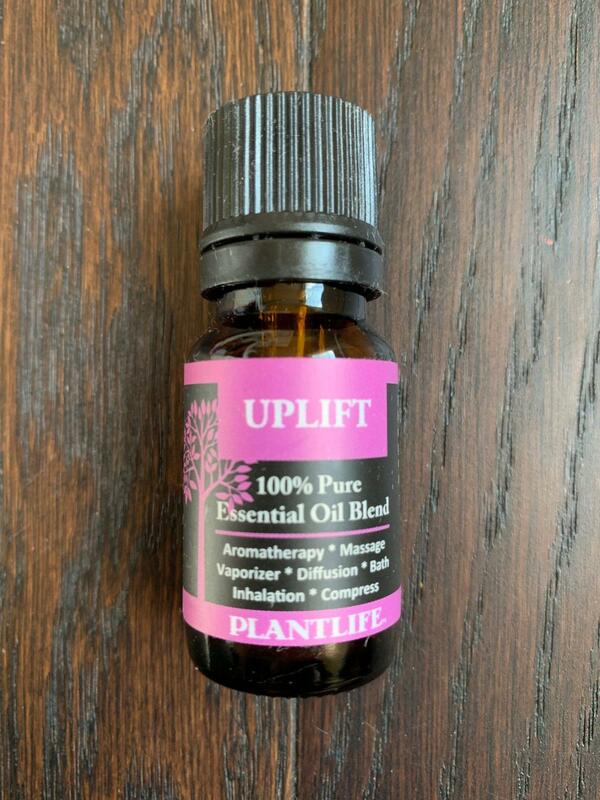 ~PlantLifeUplift Essential Oil ($10): Now that I have figured out the best way for me to use essential oils (in a diffuser), I love receiving them in subscription boxes. Not only does this smell amazing (it is a citrus blend), but the pure, therapeutic blend of essential oils is also known for their mood-elevating properties. 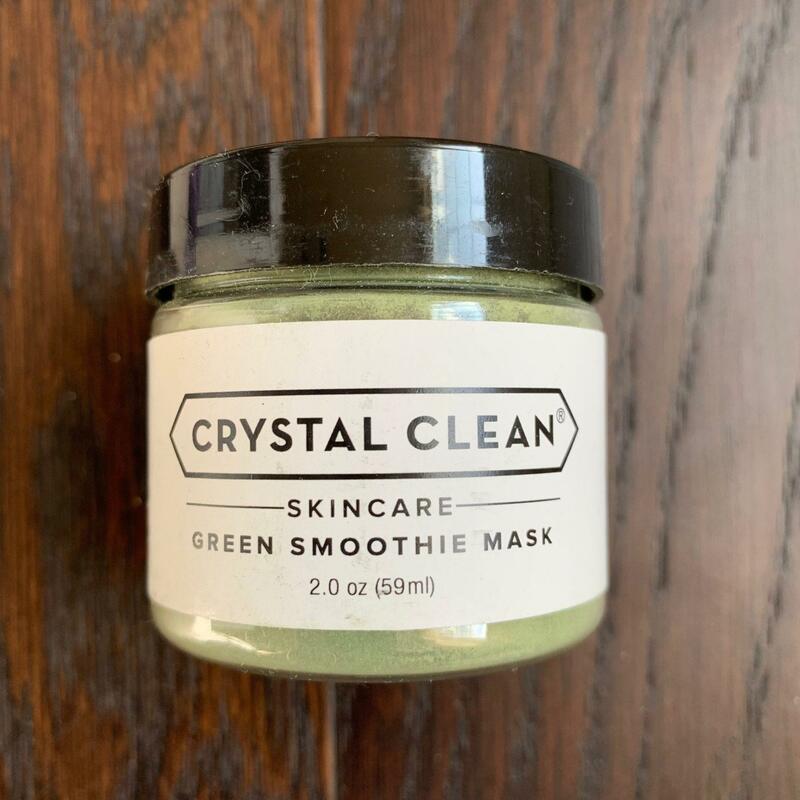 ~Crystal Clean Skincare Green Smoothie Mask ($16): The ingredients in this mask are formulated to relieve redness and inflammation due to acne, and rosacea and help other skin conditions such as eczema and psoriasis. My favorite part about powder masks is the ability to customize them to your specific skincare needs. You can mix with water, yogurt, honey, coconut oil, you name it! 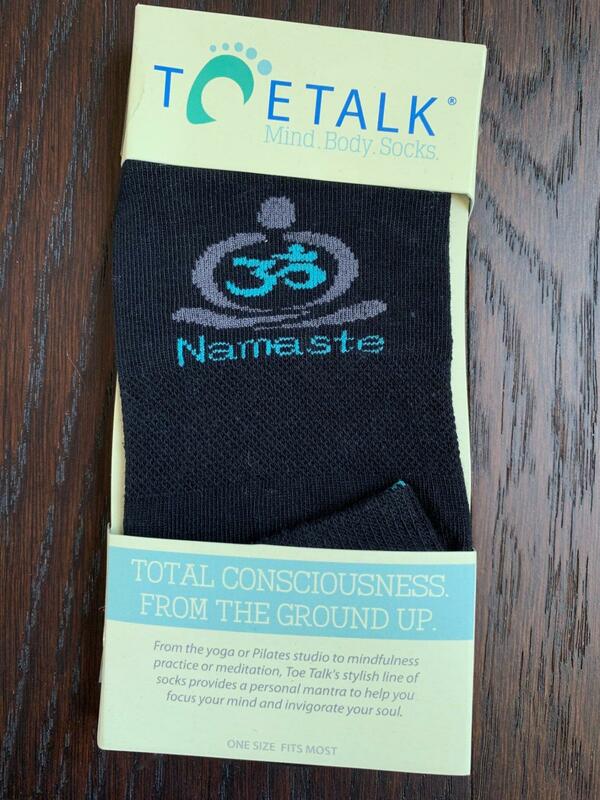 ~Toe Talk Namaste Grip Toe Socks ($12): Sticky socks! 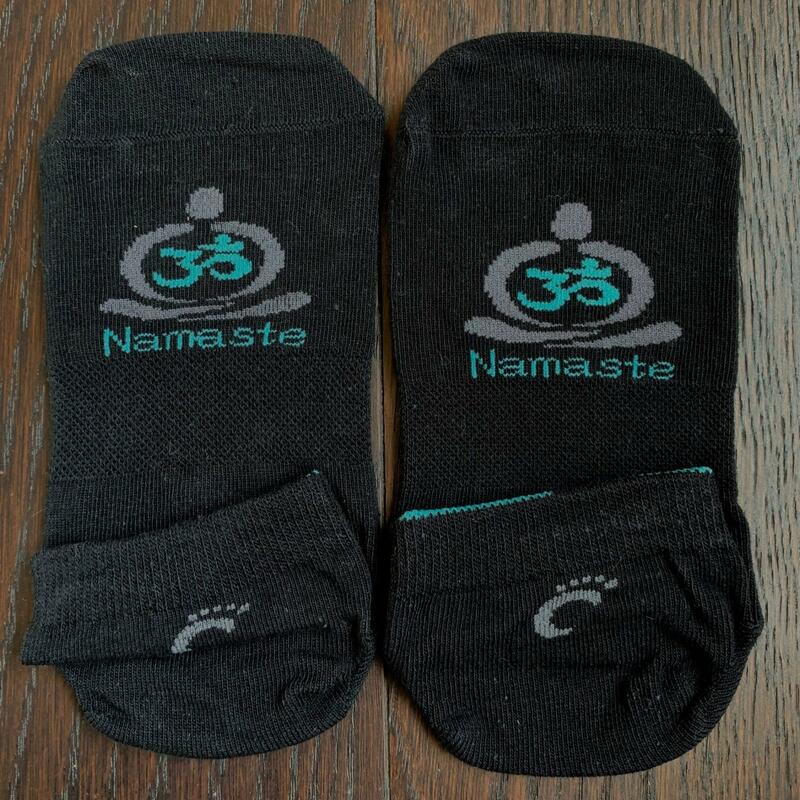 I do not practice yoga, but I do barre and can always use sticky socks. 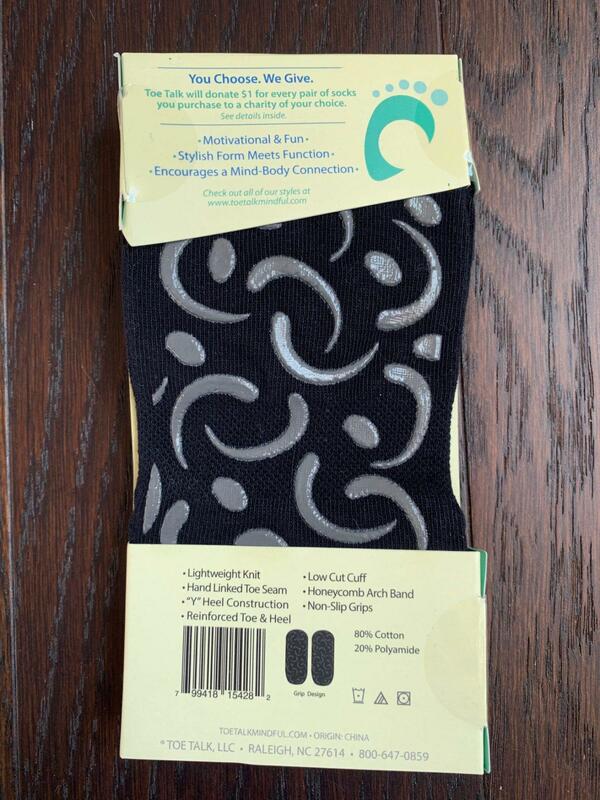 These are thin, comfortable and stay in place. 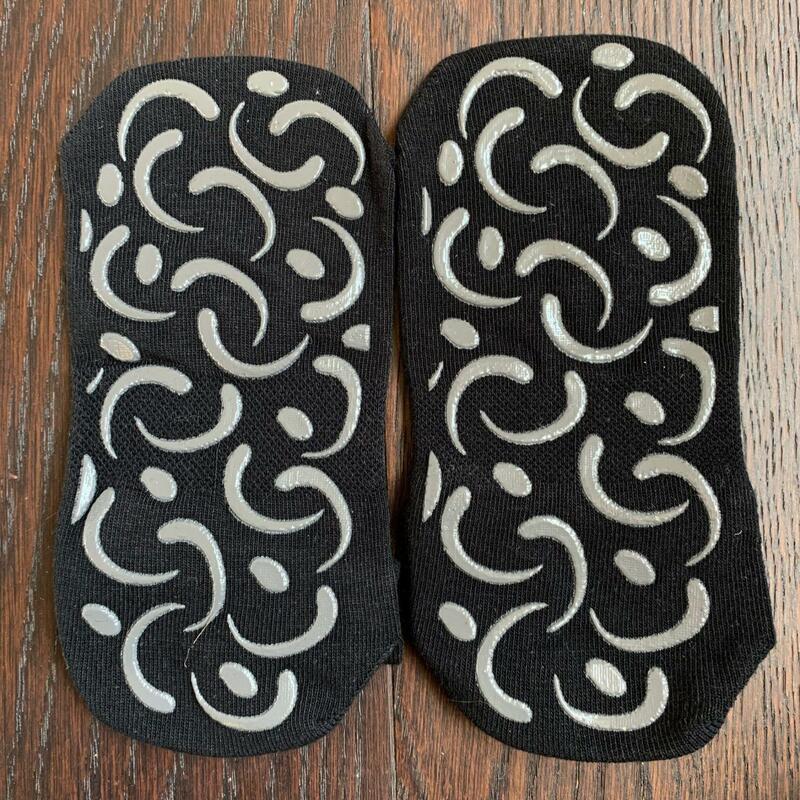 They have a lot of grips to help with your practice as well. 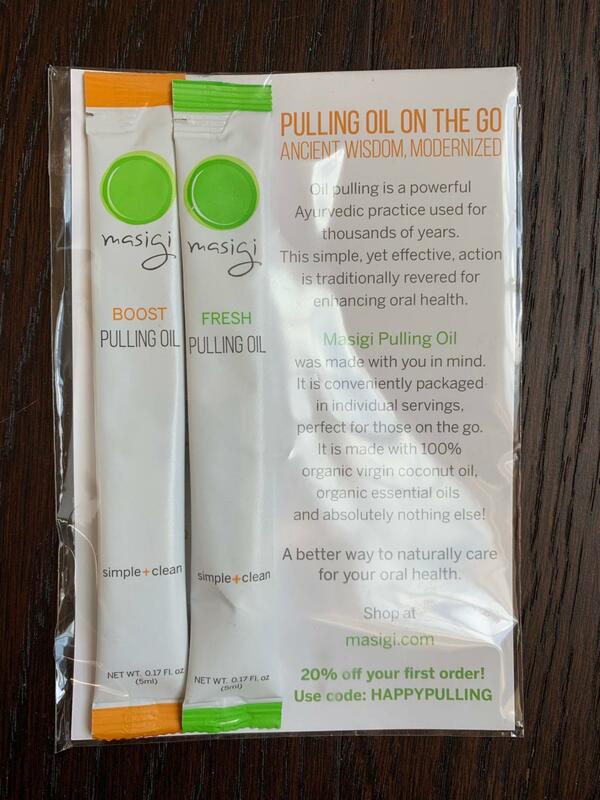 ~Massagi Pulling Oil Packets (2) ($6): I could never quite get into oil pulling, but I know people who swear by it. Oil pulling removes bacteria from the mouth and promotes strong oral health. If you are into oil pulling, these packets would be ideal for traveling! 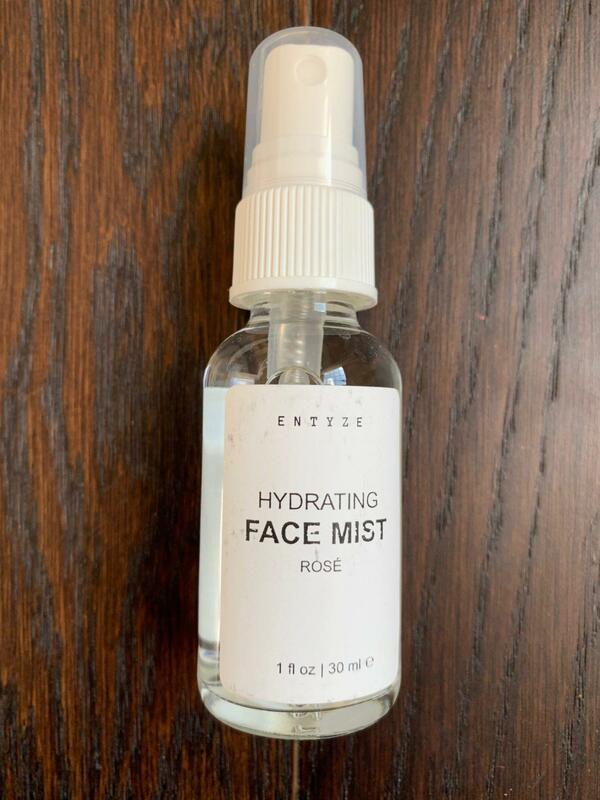 ~Entyze Rose Hydrating Face Mist ($10): Ahh, this feels so good to spray on! It contains moisture enhancing rose to soften, tone and hydrate your skin. 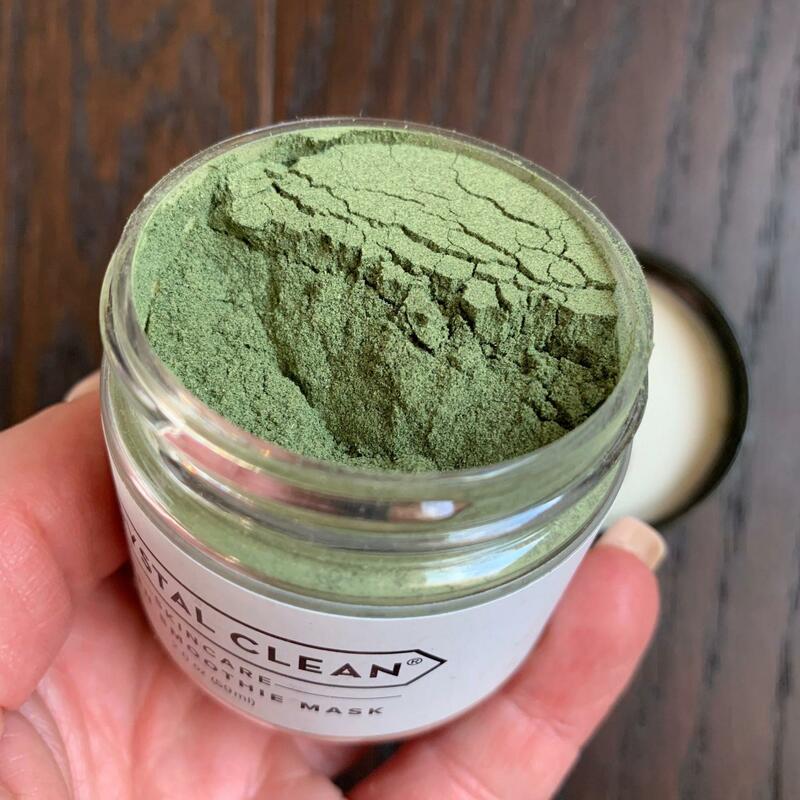 It also contains white willow bark which is naturally high in salicylic acid that aids in unclogging pores and is excellent for reducing blemishes (that is key for me). I have not tried it yet, but I suspect it would be fantastic chilled in the fridge and used on a warm summer day. Can it be summer now?? 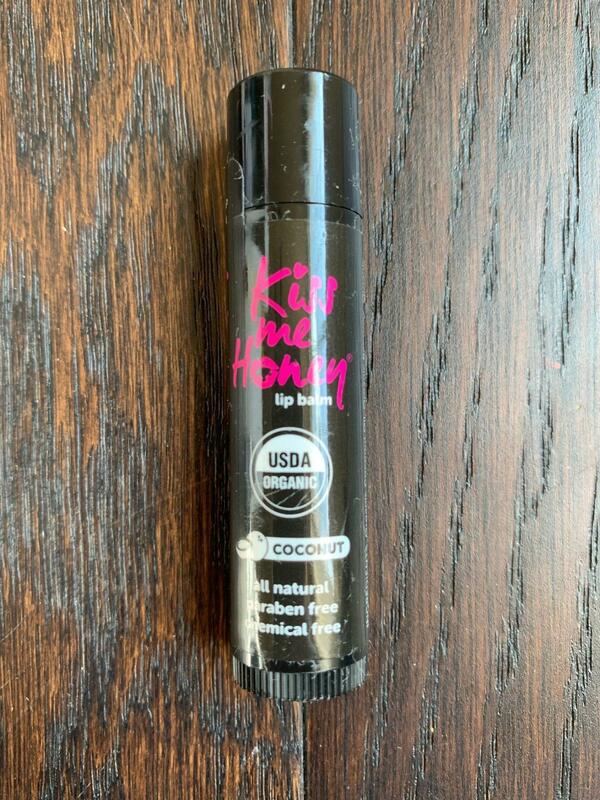 ~Kiss My Honey Coconut Lip Balm ($5): Smells good and tastes great! Two thumbs up from me! 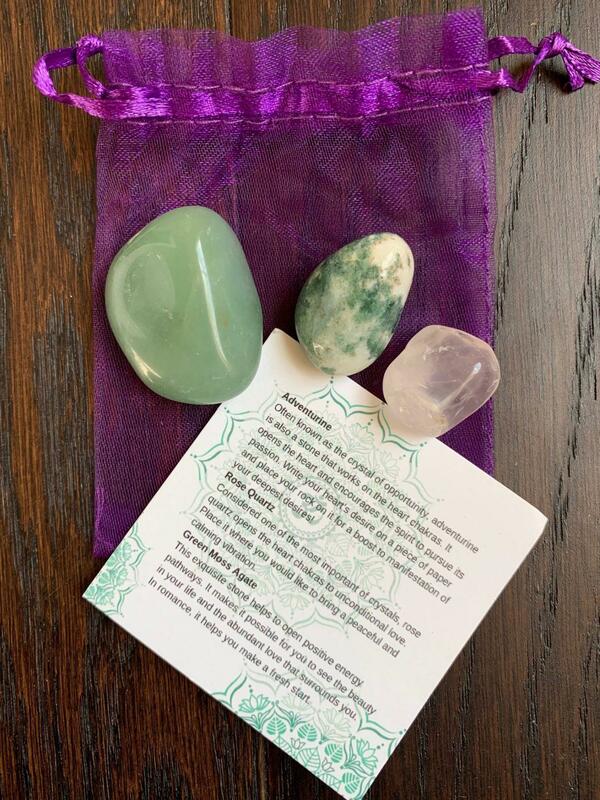 ~BuddhiBox Healing Stone Trio ($16): This trio contains rose quartz, green moss and aventurine agate stones. According to the information card, each stone stimulates the heart chakra and encourages self-love while also promoting passion and kindness. I can get behind that! All totaled the February 2019 BuddhiBox had a value of $70. That is over double the cost of the box, but not only was it a great value, it was well curated with useful goodies. If you are interested in subscribing or want to learn more, you can check them out here. ← FaceTory April 2019 Full Spoilers!